I wrote a news report for Crossing Zebras about the sad discontinuance of formal leadership and operations of Red vs. Blue (RvB), one of the largest new-player-friendly organizations in EVE Online. I have many fond memories of tangling with RvB during my days with EVE University. We often sparred against each other, and our regular wars were some of the best times I've ever had in EVE Online. Over the years, E-UNI and RvB developed a friendly rivalry - we shared a common passion for helping new players to find fun in the game. With over 8,000 members, running RvB was a major headache for that alliance's leadership team. The administrative workload was enormous, and unceasing. It was inevitable that they would eventually suffer from burnout, and that appears to be a significant factor in their decision to stop formal operations. But the RvB leadership also faults another factor - "declining numbers in EVE, in general." Indeed, the average number of concurrent logged-in players appears to have been drifting downward for a while now. This worries me a great deal. When a major player alliance like RvB - a renowned institution in the game for years - cites reduced participation as a reason for folding, we should take note, and get a little nervous about what this says about the state of the game, and the direction it is heading towards. Even so, whether or not "declining numbers" foretell the end of EVE Online remains a matter of debate. I would argue that at least some of the statistics show the effects of positive changes by CCP Games, including the prosecution of players abusing input automation, which reduced the number of multi-boxing accounts. This was a healthy policy change which will be good for the quality of the game, in my opinion. Regardless, CCP's long, deliberate, drawn-out, incremental and multi-phased approach to implementing changes to sovereignty mechanics in null-sec space have taken a toll on overall player activity level. There are no major wars in progress in 0.0 at the moment, nor have any huge, interest-stimulating battles like B-R5RB taken place recently. In fact, the sov mechanics changes that have been implemented so far discourage such actions. This has led to a persistent case of general "EVE malaise" in 0.0, which has depressed daily log-in counts. Most people think of RvB as a newbro-oriented organization. This was true to a point, but as the RvB leadership pointed out in their recent announcement, a more significant part of their membership has always been bittervets just looking for good fights. Many of RvB's members are alts of players whose main characters are based in null-sec space - they joined RvB looking for easy, quick PvP diversion. Therefore, the decline in RvB participation is directly related to the reduced level of activity by null-sec players. With fewer 0.0-based players logging in regularly, it was inevitable that RvB would see their membership engagement go down also. RvB's organizational structure was heavily dependent upon a relatively small number of highly dedicated leaders managing all of the administrative workload. Having been a director in a sizable organization myself, I can attest to the difficulty - and the complete lack of fun - that such an administrative burden entails. I managed part of a corp with more than 2,000 members, and it was daunting - I can't imagine what effort is required to manage more than 8,000 people. Many large corps manage by assuming that people will need to take breaks every once in a while, and that turnover in the leadership ranks is inevitable. In fact, they view it as normal and healthy. They therefore build a hierarchy to distribute the workload - and more importantly, to "farm" new, revitalized blood into the leadership ranks on a continuous basis. Large organizations like Goonswarm and E-UNI excel at this, and is one of the principal reasons both have endured for so long - and conversely, why RvB's leadership eventually succumbed to burnout. 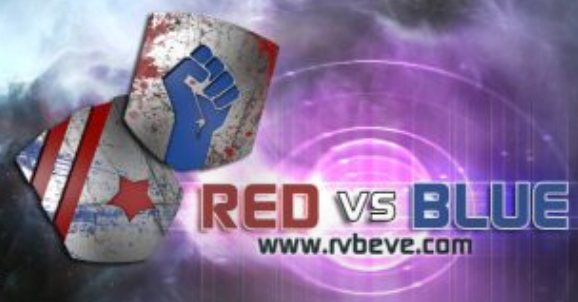 Was RvB a newbro PvP training organization, or was it a resource for casual combat for veterans? Over time, the disparate needs of two very different constituencies tore RvB apart. If RvB is to be reborn, it needs to first decide what it is, and pick a singular focus. No one can serve two masters well for very long. Personally, I think RvB would be better served to cater to veterans and focus on casual, fun, easy PvP combat. If new players want to join, that is all fine and good, but novices require special care and feeding, which other training corps like E-UNI are better suited to provide. This is utterly beyond the control of any aspiring RvB leader, as it depends entirely on CCP Games to finish what they started: revamping and revitalizing null-sec space. If RvB is going to continue to serve alts of 0.0 players, then they will be dependent upon the happiness of null-sec to ensure a high level of participation in the game. The next major update, Citadel, to be rolled out in the spring of 2016, represents a huge leap towards the completion of revised sov mechanics. Certainly, citadel structures will affect every kind of space in New Eden, but they affect what happens in 0.0 far more. Up to now, the sov mechanics changes have focused mostly on how people fight for dominance in null-sec. With the introduction of citadel structures, players in 0.0 will finally have something worth fighting for, other than just their flag of ownership posted in a system. In addition, the sweeping redefinition of the roles of capital ships, also part of the Citadel update, will give null-sec players new and exciting tools for bashing those huge structures and each other. The Citadel update will determine if the slow decline in player log-in numbers will continue, or if it can be reversed. If citadels and re-balanced capitals provide enough incentive for 0.0 players to launch their clients on a more frequent basis, then RvB has a chance to lure more alts of those veteran players back into its ranks. Those vets will want to have a place for casual PvP while they wait for the next major action in 0.0 space. The Citadel update represents an opportunity for RvB to return to its former glory, if they can re-organize in time to take advantage of the potential upswing in player activity. I never joined RvB, though I considered doing so many times. I often thought about throwing an alt in there and just have some fun shooting at ships and getting blown up. It appeared to me that RvB was always a fun group to fly with - they never took themselves too seriously. And now, that option, while still available to some extent, is no longer the same as it used to be, with the ending of formal operations. Nevertheless, I've decided to finally get an alt in to RvB, while I still can, before the option disappears forever. If RvB does fade away completely, that will be a sad indicator of the future fate of EVE Online. I hope that doesn't happen. Perhaps, with new leaders, organization, focus and a little good fortune provided by CCP's success with Citadel, RvB might rise again. I wait and watch in hope. Posted in Commentary and tagged with RvB, EVE Online, Citadel. October 29, 2015 by Neville Smit.